Riviera Nayarit Mexico Blog: Care For A “Pacific Treasure” Cocktail? Care For A “Pacific Treasure” Cocktail? The Riviera Nayarit is a culinary destination that seeks to innovate in every way possible—cocktails are no exception. 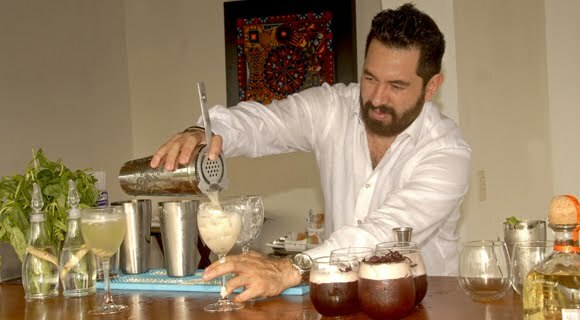 Today we’d like to share the recipe for the delicious “Pacific Treasure” cocktail, created by none other than Israel Díaz, the Riviera Nayarit’s Mixology Ambassador. “This cocktail was inspired by the fruit found in Banderas Bay, in complete appreciation for the fertile land that has provided us with such an amazing variety of exotic tropical fruit,” explained our star mixologist. Macerate the pineapple in a mortar with the syrup and the mint leaves; add in the aloe vera juice and finally the tequila. Transfer to a shaker and mix vigorously. Strain over a glass goblet and garnish with mint leaves. The Riviera Nayarit is Mexico’s Pacific Treasure and this cocktail represents part of its bounty. Enjoy!